It took me a while to figure out how to add a gadget/button to my blogspot blog allowing someone to contact me by email. A few bloggers have asked me how to do this, so I thought I’d make a simple tutorial. I don’t know if this will work on blogs other than blogspot. 1. Choose the JPG image you want to use for your gadget, your mugshot is always nice, or below are a few I designed for the taking. If you want to use one of these, click on the image of choice and drag or copy to your desktop. 5. Type in something like “Contact Me” or “E-Mail Me” or simply leave it blank. 9. Back on your CUSTOMIZE page, drag your new e-mail gadget to wherever you want it in your sidebar. 10. Leave a comment and let me know how it works for you! Get your matching FLICKR gadget buttons HERE! HERE are even more Email blog buttons for you! “Visit my Older Posts”graphics HERE. Leave a Comment graphics HERE. Ornamental set of button graphics HERE! UPDATE: I have had a few people note that they are unable to email me through my button, most can, but for those who can’t, I’ve added the actual address just above my own contact button in the column to the right. I broke it up by using (at) instead of @ and (dot) instead of a dot to keep spambots from abusing my email address. Most people know to type out the email correctly when corresponding. You may consider doing the same on your blog. This entry was posted in Uncategorized and tagged e-mail, e-mail gadget, email button, email widget, free widgets, freegadgets. Bookmark the permalink. oooo! I was wondering how to do this! Thanks! thanks so much…i used the blue icon..looks perfect on my blog!! yippeeee i did it. thnxs so much! Thanks Cathe your a doll!! this is so sweet of you! i think i’ll have to add one to my blog – thanks! Thanks so much! I’m going to try this and let you know if I manage to do it. I did it!! Thanks so much!! I’m going to post about this on my blog in the next day or so!! Wonderful , I used the red one. Thanks so much as I would of never figure that out by myself. OooH! I love them. I’ll have to see how they work on wordpress. Thank you so much for sharing…I am definitely going to grab one. Thanks for the designs and the instructions! You are soooo very generous with your info and graphics. Thanks for teaching me this a while back! I still can’t make my mugshot smaller on my blog. It makes me seem big-headed, literally! ps. my twisted mind read the first email graphic as “lick here to email me”. must get more sleep! You are so generous with your downloads. Merci! Found your link on etsy forum! Thanks for the tutorial! I had no idea how to do this but it worked! I choose the vintage postcard…love it! thanks! Great tutorial! Thanks so much for sharing. thanks so much! am now following you to catch more of your clever ways! Thanks for sharing, these are great. Wonderful! Thanks so much. I used the small green button! So nice of you to share. This is wonderful, I am just starting my blog up. thanks so much, the icons are wonderful as well. Your graphics are so cute, Cathe, I may have to actually start a blog so I can use one on them! Thanks! I’m going to have to try this! Thanks Cathe for the info, i’m going to go and try this out. Oh thank you so much! I’m going to try this. Thank you so much for sharing this information, and also for the very cute graphics. THANKS! I used the blue rectangle. Thanks so much for sharing! I had no problems with it…I used the ‘click here to e-mail me’ postcard…Thanks again! Thanks so much for sharing! I had no problems adding it, I chose the ‘click here to e-mail me’ postcard. Thanks again! Thank you so much for sharing! I’ll add it to my blog. BTW… great idea on providing a tutorial. I might do the same with adding a button and scroll box. Very Cool! Thank you SO MUCH for sharing this! Finally went back and did this — thanks again for the post. And I loved the newest icons you posted. I was going to make my own, but ours are so great, I got lazy. I did it, and I blogged about it. Thanks! Thanks once again for the freebie e-mail logo. Love your freebies! Thanks so much for this step by step guide. It made it so easy. I used your old postcard button, so cute! Thanks! Worked like a charm. I’ll be doing a blog entry about it in the next couple of days. You’re the best Cathe! I loved the postcard and used it for my blog…your instructions were perfect…thanks so much!! Thank you so much for the free email jpg pictures…I plan on using one for mine. I used the pink & black one! I just made a post about this with your links Cathe!! How wonderful and generous of you! Since I have three blogs, I didn’t really have to make a choice, as I was able to use three of my favourites! THANK YOU so much! I also have written a post about your generosity today on my blog and will be adding you to my blog list so I can check back and visit regularly! Very nice of you to do this! Came here via High Desert Diva. Thank you so much for this tutorial and pictures for the links. I love it and it was soooo easy. Thanks so much for sharing. Great question, Pat, I don’t know the answer, but maybe someone else might so check back! If I figure that out, I’ll post it. I came here via Tidymom. Enjoyed my visit and thanks for the cute gadget! Oh, thank you, thank you, thank you! I’ve tried putting the link on there before and it didn’t work and this was so easy and I love the graphic. I chose the postcard one and it looks great on my blog! Thanks so much! You’re a sweetheart! Thank You Cathe! I used the pink one! Hey,, I did it!.. Thanks .. I used the pink email me.. I hope it works. fantastic, thanks for the tutorial and buttons! all set, your instructions were so easy to follow. Cheers! Thanks for sharing…how coincidental that one of my readers today sent me a comment saying that she couldn’t figure out how to email me. Not a problem anymore! I used the sewing needle w/ blue background! Thanks!! Thanks Cathe, this is something I’ve been wanting to do for a while but couldn’t work out properly! OOOH I love these! and I just worked out how to use one on my typepad blog!!! Thanks so much! Your instructions were so easy to follow. I picked a blue one that matches my layout nicely. Found it to work on my WordPress blog with a little additional formatting. WordPress bloggers email me and I can walk you through it. Thanks so much for the oh-so-appropriate needle and thread button! I’m going to try and use these – THANK YOU! This is great. Going to check the others, too. Thanks so much for these buttons. Thanks so much for sharing such lovely creations with the rest of us! I just couldn’t resist the postcard e-mail and the pretty blue twitter bird for my blog! I just found your blog today and am quite enjoying reading it. Thank you for the email icon, I’ve placed it on my blog. It works great. This is great! Thanks a bunch. Thank you so much I used the postcard one—this is great!!!!!! I am so glad I found you!!!!!!!!! You ahve a lovely site..and thank you! I can not get it to work as a linked picture on website, so I have saved them to my computer, is that what I am suppose to do??? Drag or copy to your desktop or a file folder and then upload from there. Email me to let me know it that works for you. Thanks again! thank you SO MUCH for the gadget & the help!!! This worked beautifully and added a perfect element to my blog that I could never have created myself. Thank you so much! I love your work. It worked!! Thanks so much…I’ve wanted to know how to do this for a long time!! Cathe, thanks so much for the wonderful graphics…I finally got my e-mail to work! Yippeeeee. Let me be the 3092435784932 person to thank you for this. I am so inept when it comes to this stuff. so thank you…just THANK YOU! Thank you 🙂 Fantastic, been looking for something like this for ages! Thanks! Im new to blogging and wanted some pretties for my blog! I used the black thank you one, it worked great! Thanks so much for posting this. It was a breeze. It looks great and makes it so easy to get emails now. I grabbed one of your gadgets. Thanks! The green one looks great on my blog. Thanks for sharing! I’m using the blue needle and thread. Looks great! wow, thanks so much! i got an email button and a comment button. love your designs!! Thank you so much for your email tip. I love learning new things when it comes to my blog. I choose the red one and I love it. You are so smart! And so nice to create all of those cute buttons! I grabbed one right up! Thanks!!! Thanks so much! I just finally added one of your buttons to my blog and it works great! I have been searching for an easy way to do it. No code YEAH! Works perfectly. I picked the big green one at the top of the post. So generous of you. Thanks. I just added your comments gadget! Looks so cute. Thanks! Yay! It totally worked for me!!! It was sooo easy, too! I have always wondered how to do this, and had no idea the “mailto” was so simple! 🙂 Thanks! Thank you so much for this tip! It works great! WOW WOW WOW Thank you! You are so savvy. THANK YOU SO MUCH! I’ve wanted to put my email on my blog for a long time now. Thanks for making it easy AND for the cute graphics! Thank you for the step-by-step instructions and wonderful jpg images! Thanks for the tip! I got it up on my blog and I LOVE it! Worked wonderfully! Thanks for the great graphic! Thank you so much. I am barely computer literate and I need all the help I can get. I really appreciate your free designs also. Thank you, thank you, thank you. Just what I needed but was too dumb to be able to figure out on my own! Thanks so much for sharing these lovely buttons with us! The rect. works perfectly with my blog! I can’t thank you enough for this tutorial. I’ve been wanting to do this for such a long time, and haven’t been able to figure it out. You’re the best! I just added an email button to my blog, thank you so much for sharing!! I just added an email link to my blog – thanks so much!!! You have a wonderful site!! SWEET! That took me 3 minutes; great instructions! That was way easier than I thought it would be. Thanks! OMG! You won’t believe how many other more complicated things I tried. This was so simple and it WORKED!!! Thanks! Thanks for sharing. I found exactly what I needed. Thanks so much for your thorough tutorial. I had no trouble at all and it works great. I really appreciate it and love all your graphics. I've been wondering how to do that. Thank you! thanks so much, these are so pretty and so wonderfully girly! I just came across your blog and love it! Thanks for this how-to on email gadgets, I could never figure it out! I love all your gadget artwork too, thanks so much for sharing it! I did it. Thank you so much! My blog is brand new and I'm still learning my way around blogspot but your tutorial was perfect – and your blog is as helpful as it is fun to look at. Thank you very much. I have used the old postcard and it looks great. thank you so much for sharing, they are all so amazing!!! and it took me 2 hours with not-so-great instructions from other sites in the html section … and 2 MINUTES with your Wonderful Instructions!!! Plus … I had seen your postcard on another site … and wanted to use it … and There It Was … You're the Creator … WOW … what a great end to the day. Thank you so much….I didn't have a clue how to do this! Thanks so much. I just started to set up a blog and was wondering how to do this. Thanks for sharing this information. I'm using the postcard for my blog! you are amazing. I was going out of my mind.. trying to do this and its oh so simple. Oh my goodness that was sooo easy. I've been wanting to do this for a while. You're an angel! hi! I just found your blog–thanks for all the free images and for the clear instructions for installing gadgets and such–I just did the email link and it worked perfectly! (I used the postcard that says, "email me!"" Thank you so much! That was super easy. Thanks for making this post, it was a real help! This was wonderful and such a time-saver! Thanks for sharing how to do this. I used the postcard and it looks wonderful with my theme. How did you create the pictures? I would like to make some for a few other "buttons" on my blog. Thanks! Hi! I used the red stitched icons and they look really cute on my blog. Thanks so much! I just used your E-mailme gadget, thanks a lot, it works! Kathe, thanks so much for sharing these. I used the cute flower "There's more to see – click on older posts". I still haven't figured out how to make a button for my blog so people can list on theirs. I'm not so sure I even understand blog etiquette (opps – that might be spelled wrong). Do you ask if you can put their button on your blog or do you wait for them to ask you? I know it sounds silly but I'm just trying to figure this all out. Wow this is an old post but it's still useful. I used your green email me button today . Just so you know . Thanks for the info . It's just what I needed . Can't thanks u enough for this… have been trying to get this done for quite some time now… bt no success… yr post made it so so simple for me!!! Thanks so much!!! Thanks for this button, it's awesome, I love it!!!! 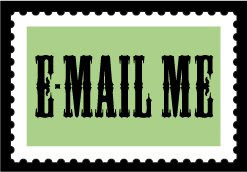 'email me' button to my sidebar and it works…thank you…thank you! Made my day! i'll join the choir… Thank you so much for posting this. super easy! Thanks for the tip. It worked and I love it! WOW! That worked great! THANK YOU! Thank you! I just added one of your graphics to my blog. Thanks again! Thank you so much – I have added your email logo to my blog. Can't work out how to shrink it though….any tips? You are a lifesaver! Thanks so much! Thank you, you are very useful mammal. I was looking for some different images and loved the buttons, thanks!!! I just tried this and it worked like a charm. Thank you so much!!! THANK YOU SOOOO MUCH! You deserve to wear a crown today for sharing this simple "how to"!!! Thank you, thank you, thank you! This worked like a charm. Thank you so much for sharing! Blessings to you. thank you so much. What a big help! I copied a few images to switch out when I change my backgrounds. Thank you, thank you! I've been meaning to do this forever. I made my own image and followed your super clear instructions. Thank you so much for posting this… I have been looking forever for an email button and I just couldn't find out how to do it… it worked like a charm no problem at all… the only thing I can't figure out if it is possible to centre it. I know how to centre ones with the links but I can't figure out how to do a picture. Any help would be greatly appreciated. These are awesome – thank you so much! I love all your buttons!!! I've used a whole bunch on my blog. Thanks again!!! You rock! Seriously, I have been wanting to do this for a LONG time and it was so easy! Thank you, Thank you, Thank you! I used the first little postcard picture, too, too cute! Thanks for the tutorial and the sweet widget! Wonderful! Just found this and it's perfect! Thanks! Thanks for making this so easy!! I had already tried it several times with HTML code and it just wasn't working for me. Thanks for the image too, it looks great on my blog – I used the woman's hand with the pen. Worked beautifully! Thanks so much! Amazing….it works…thanks a lot for the gadget tips…. Thank you so much for sharing this. So easy to set up! Thank you so much!!! I wasn't sure how to do this, so I really appreciate the information and pictures. I used your postcard image, and I love it!!! Thanks again! Thanks very much for the tutorial – I was trying to figure out how to do this! Thank you so much!! I added this feature to my blog…I really appreciate your sharing! OMG! This is sooooo awesome! I was wondering how people did this! Thanks so much for the easy to follow directions and cool pics to choose from! Greatly appreciated! Cool, it works great! Thanks! Thank you, Cathe! I used the vintage postcard, and it worked perfectly. Thanks so very much for sharing! Works like a charm. Thanks for the post. It was easy when you explained it. Thank you so much! Was trying to figure out how to do that! This is a life Saver, I am going to use one of your icons , Thank You SO much, it is so easy a caveman can do it. Thanks for explaining it in such simple terms. I'll be checking back to see what other "just something" you make. I did a google search and found these instructions. Thanks for posting and thanks for the image! Oh my goodness!!! THANK YOU! I'm so new at this stuff and this was extremely helpful! I'm going to write about your blog! thanks so much! I've been searching around for this feature. I always wanted to include such button but had no idea how to do. thank you so much for your easy directions (and photo)! You're the best! I added it to both my blogs! http://craveitall.blogspot.com/ and http://storiesofacompulsive.blogspot.com/ Thanks so much for the help! Wow, I was searching for how to add an Email gadget and I'm so glad I found your blog! Thanks! Thank you so so much! It worked like a charm! Thank you very much, this came in handy. btw your designs are beautiful. thanks so much for this, it's just what i was looking for. and really cute icons! Thanks for this advice and the icons. I just started an advice blog and this was a perfect thing to add to my page. Thank you very much for your easy-to-follow tutorial and the e-mail-envelope icon that I snagged to use. You're a peach! Hey do you have an update to this tutorial? When I go to "add my own" I'm directed to "add by URL" rather than picture. Any ideas? doh, I figured it out. Thanks for the tutorial! Hi anotherdae, sorry you're having trouble. In blogger, you should be able to add your own picture with the link as mailto:blablabla. I'm not sure why you are not able to do that. You can email me directly at cathe@justsomethingimade.com and we can try to figure this out! I just found this blog, thank you so much! I used your email buttons on both of my blogs! I came across the link to your tutorial on Tip Junkie! Thank you so much for putting this together. It was *so* easy!! I will definitely be following your blog and seeing what else you have to offer. Thank you for sharing these beautiful buttons and the how-to! I chose the airmail button and it worked perfectly!! Hi. Thank you as I am clueless how to do this! I have been getting a lot of traffic and people have wanted to contact me and now they can with the cool black button with the colorful letters. Thank you!! Thanks a lot for these fantastic Buttons and your descrition…yes i've got it :o)) I love your Vintage Style and your BLOG it is really fantastic.. Your tutorial was right on, thus making it very easy to follow. I now have an email button..thank you. Thanks so much! I've been wondering how to do this and now I know. Perfect instructions! Thank you so much! This was very helpful. This blog post came in handy! That's totally awesome. I used the blue icon and it works perfectly. I really loving this! Thanks a lot! Thank you so much!! I added this to my blog, and it looks great! Thanks! I needed the help and the little bird with letter is perfect for my site. Hi Cathe …stumbled upon this blog recently and I must say, it helped me get started on Blogging. Love the great ideas and work… 🙂 Will definitly be coming back for more…!! Thank you sooooooo much! I have been wondering how to do this and you made it so easy. I really appreciate the help! thanks a lot for the e-mail picture! The email button worked! Thank you for sharing your design and how to link it. It took a matter of 30 seconds! !Thanks so much! It worked – THANK YOU! Thank you!!! YAYY! You made another smile today! It worked for me. Thank you so very much. I have been wanting to add an email button to my blog for some time now. These instructions gave me the confidence to do so. This was great. Thank you so much for taking the time to do this! Thank you so much!!!!!! !I have tried so many times to fix this link, with no success, but now it is so clear and easy!!!! !great tutorial!!!! It worked great! Love it! Thank you so much! Your directions were great and and loved the envelope email button. Thank you so much for sharing your wonderful artwork. I love your site – so interesting and intuitive. Just fabulous! Thanks so much! You made it so easy and I love the graphic and colors! Thank you so much for the very helpful and easy to follow tutorial and also for the use of your lovely images. I’ve successfully added this to my blog and I’ll post back a link too. Thanks. Thank you for taking the time to create this page and share this information! I am trying to find a blogger html for where people can submit their name and email for more info. wow! I spent 2 sleepless night searching for this and Im glad Ive found it here. Thanks for this great creation. WOW. Thank you so much! I never would have thought to do it this way! It worked! Thanks so much, yours was the first page in my google search of email me button on blog. Awesome! Thank you so much!!! Exactly what we needed!!! Have a great year, full of health and smiles!!! Again, thanks for sharing!!! THANK YOU SO MUCH!!! After searching unsuccessfully, I found this and it’s EXACTLY what I needed! Works perfectly! Thank you for both the instructions and use of your clip art. It’s very generous of you and I truly appreciate it ! amazing, I spent hours trying to figure out how to do that!!!! thanks a million!! Thank you so much. Worked perfectly! Tutorial was super easy to follow but I’m not sure if it worked 🙁 I viewed my blog after I saved the new gadget and only a blank tab page came up when I clicked the new email button 🙁 Does anyone know what I could’ve done wrong? This tutorial is a heaven sent! Used your postcard image for my blog, http://www.katdyfinds.com. Thank you so much! Terrific site! I especially love the design you created for the contact widgets! Adorable graphics! Totally perfect for my blog! Thanks! I’m still a newbie at this so If you have any info check out my blog tell me what I need to attract more visitors thanks! I hope we become the best of friends. I do like this article adding a button. I was really excited to run across your tutorial for adding an email gadget. I’m very frustrated at the moment as I have wasted about an hour and a half trying to add this to my blogspot blog. Needless to say I still don’t have an email button on my blog. I can’t find the customize button on my blog anywhere, I can find the add gadget button but it only wants me to use their gadgets and funny enough non of them have anything to do with email, I can add everything in the world having to do with Amazon or other stuff like that. There is a spot to add my own gadget but that did not work for me either, it wanted me to put in a URL and when I tried putting in my email address as suggested it told me the url included incorrect characters. I don’t know what I’m doing wrong , I’m not usually a stupid person but apparently I am tonight. Any suggestions would be greatly appreciated. Thanks for the great site….I am a newbie and so lucky to have found a wonderful resource. It worked!!!! Thank you SO MUCH. Now I can go to bed! It doesn’t work for me. There is no “customize” button on my ‘layout’ page, and my attempt to enter the mailto fails since it is an invalid URL. LOVED THIS, Thanks! I was able the code to an icon of a wine glass with yahoo on it. Super cool! I’ve recently launced a new blog, and I used 2 of your cute buttons – Email and Comments – you can take a look at the link. I used the email me blue button above with black writing. I am wondering if you have those same buttons available for About Me and Blog Archives. I think they would look really cute on my blog. If you do not have them available, could you custom make them for me? If so, how do I purchase them? Please let me know. Thank you! Hi! I would like you to know that your tutorial helped me a lot. I am now using the email widget that you made. Thank you very much! Hmmm…something appears to not be working. I definitely followed your instructions exactly, but when I lick on my jpeg, nothing happens 🙁 Try it out at BudgetForBaby.com. Thank you sooooooo much. I can’t tell you the amount of hours I put into this prior to finding you in a google search. Why doesn’t blogspot just tell us how to do this? Thank you soooo much! Wow, thank you, it worked perfectly! And I grabbed the old-timey post card graphic above. Thanks for this , trying it now! It worked perfectly! Thank you soooo much! I used your instructions to put my e-mail button on my blog. Thank you very much. Thanks so much! Very simple and easy to follow! Thank you so much! This worked beautifully! Thanks so much for your post! I can’t believe that was so easy, haha. Not sure why I waited so long to figure that out. 😉 Thanks so much! Thank you. Im really grateful for this tutorial. THANK YOU THANK YOU THANK YOU!!!! it worked like a charm! I so appreciate it! This worked like a charm – thank you! This WORKED!!! YAY!!! lol its exactly what i was looking for!!! THANK YOU!!!!!! It worked PERFECTLY! Thanks a million! Yeah! Thank you, this is by far the most simple explanation I’ve read……and it worked! Your blog is just wonderful 🙂 Thank you so much for sharing your knowledge and freebies with us. We now have a email us button on our blog. Yay!!!!! Thank you so much for this. I have been looking for this option for a long time. Hi Cathe, I must tell you, I am so excited because I finally have email on my blog! I don’t have it showing yet, because it is new and I’m not done. Thank you so much for the easy steps to create the link. Love love this because I’d tried other…it was such a headache!! Hi Cathe, I love your site! It’s filled with so many goodies, thank you! I haven’t been able to get my new email button to work. I don’t know what I am doing wrong. Help! I’ve left it on my blog but it takes you nowhere. The easy stuff (like adding a contact me button) should be easy. But it’s not … so THANK YOU for making this a “no-brainer” !! I just installed your clever and cute “email me” button. Thanks so much for offering your wisdom and expertise for free. I am grateful and appreciative of your time! Fee free to stop round the nut-tree sometime for a cuppa! Thanks so very much….your directions were perfect and it looks great! Worked for me thank you so much! I have looked at technical pages and technical forms, but yours is the one that makes sense! Thank you so much! Hello Cathe, it is very great, i put it Iin my site and it worked, THANKS. Thank You, Thank You, Thank You…so much. I have been having so much trouble trying to get my email linked to my blog and you are the only one that made it so simple to do!!! Thanx an million!!! Dear Cathe, thank you very much for the useful and easy to follow tutorial. I used one of your buttons on my blog and it works. Thank you! Thank you Cathe. I’ve added the postcard image to my blog. It’s so simple when you know how! Hello I have tried to add email me gadget in my blog, the image button is in my blog, when I test to click on it, it is not working. Thank so much for your directions. Love from Greece! Got it …. at last! Thank you so much for this easy tutorial. You can’t imagine how long it took me to add this contact button to my site. Now, it’s finally done and it was so easy, no complicated html codethat I had tried out before so many times. Thank you again! Thanks for sharing all these great icons! Thanks for the awesome buttons. I added the email one and the one about comments. I would love to figure out what the URL is so when they click on comments it takes them to a comment page. I was wondering how to do it and I read your post and it worked for me! Thank you! Hi Cathe, I just found your great site 🙂 I created an ’email me’ button. I was wondering if there is a way to do this that doesn’t display my own email address? for privacy’s sake. The link for newer email buttons leads to the page for “older posts” buttons. Thank you so much for sharing these to us! They are so beautiful! Grazie mille per il tuo aiuto. Ottima spiegazione e bellissime immagini. Ha funzionato tutto perfettamente. Love it, put it on a new Blog I am starting with called: Articles on Carpet Cleaning! Thanks, it was very easy.